End the frustration with these time saving return address pre-printed envelopes. Your address is printed in on the back flap in black ink. There is no need to struggle with your home printer, no more crooked prints and messy ink stamps to deal with. Choose from five different paper types and a variety of colors to coordinate with your wedding invitations. Customization takes only seconds and you get to preview your envelopes instantly. There is very low minimum and bulk discount are available. Save time and your sanity with these quality custom envelopes. Basic - smooth, vibrant, matte, 80lb text-weight paper. Contains 50% recycled content (10% post-consumer and 40% pre-consumer waste). 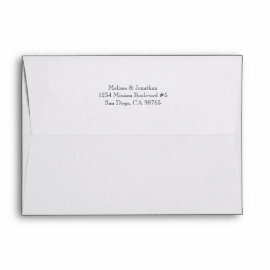 Recycle - Our 80lb text-weight recycled paper has a warm tone and smooth finish. Made with 100% post-consumer recycled content. An eco-friendly choice for all your invitations. Felt - Our 100lb text-weight felt paper has an embossed finish that feels like a fine art paper. Elegant and restrained, our felt paper adds a touch of class to all your invitations. Speckle - Small flecks and fibers with subtle color variation give this 70lb text-weight paper the look of a handmade sheet.